President Muhammadu Buhari has been conferred with a chieftaincy title in Ebonyi State by the State’s traditional council.President Buhari conferred with the title of Ochioha NdiIgbo 1 by South East traditional council of rulers led by Eze Eberechi man-hood during his visit to Ebonyi State on 14th Nov 2017. 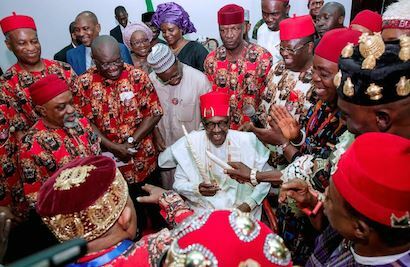 President Muhammadu Buhari was on Monday conferred with the Chieftaincy title of Ochi Oha Ndigbo (leader of all) of Igboland by the South East Traditional Rulers and Enyi Oma 1 (number one good friend) of Ebonyi State by the Ebonyi State Traditional Council, Vanguard reports. The President was also given 2,000 bags of 25kg of Ebonyi rice, 2,000 tubers of yam and a white horse that signifies strength by the Ebonyi State Governor, Dave Umahi at the State Executive Council chamber, Abakaliki. He met with the President General of Ohaneze Ndigbo, Chief John Nnia Nwodo, former governors of the state, the deputy governor, founding fathers of the state, speaker of the House of Assembly, Chairman and Secretary of the Christian Association of Nigeria, CAN, Ebonyi State chapter, Secretary to the State Government, SSG, and the State Traditional Council at the Council chamber, government house. President Buhari will be proceeding to the PA Ngele Oruta Township Stadium, Abakaliki where he will be interacting with the people of different walks of life.